First, I found a good guide at www.LimoncelloQuest.com. The ingredients in most online recipes are just about the same, but the instructions differ and I found this guide to be the most informative. The site even reviews popular brands of limoncello and charts the flavors against the homemade recipe. Illinois does not allow the sale of grain alcohol so I bought 2 bottles of 100 proof vodka. 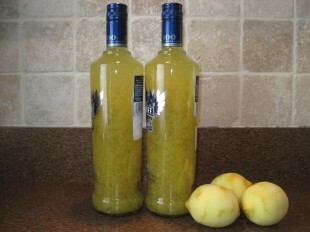 One of my goals was to make limoncello for less expensive than Pallino, the brand of limoncello we usually buy. 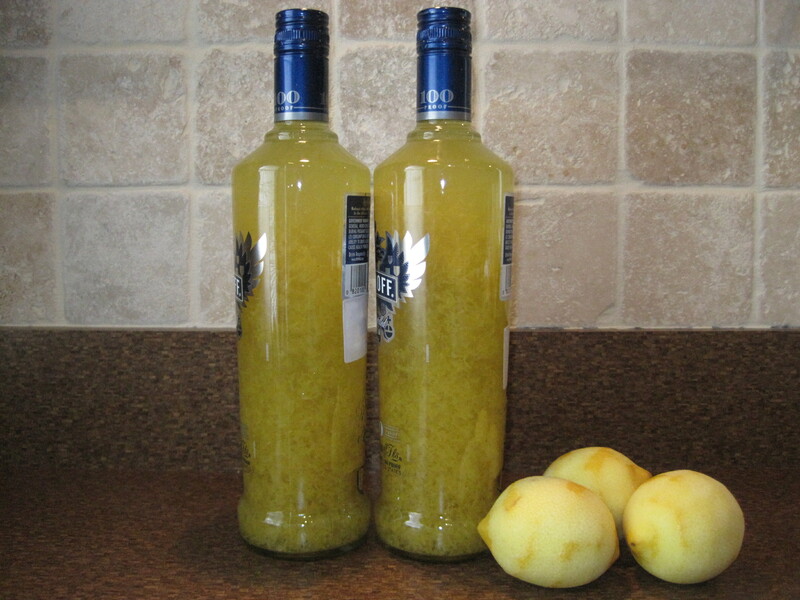 Each bottle of vodka was $22 plus the cost of organic lemons and sugar (about $10 to make a 2 bottle batch) while a bottle of Pallino limoncello is $30. And, my limoncello will be bulked up with the added sugar syrup, so the homemade version will end up slightly less expensive. It is very important to buy organic lemons to make limoncello. You are using the zested skins of the lemons and so you don’t want pesticides or wax contaminating the liquor. I bought a 4 pound bag, which was 20 smallish organic lemons. I washed the lemons with a simple veggie wash: vinegar diluted with cold water and a heaping spoonful of baking soda. 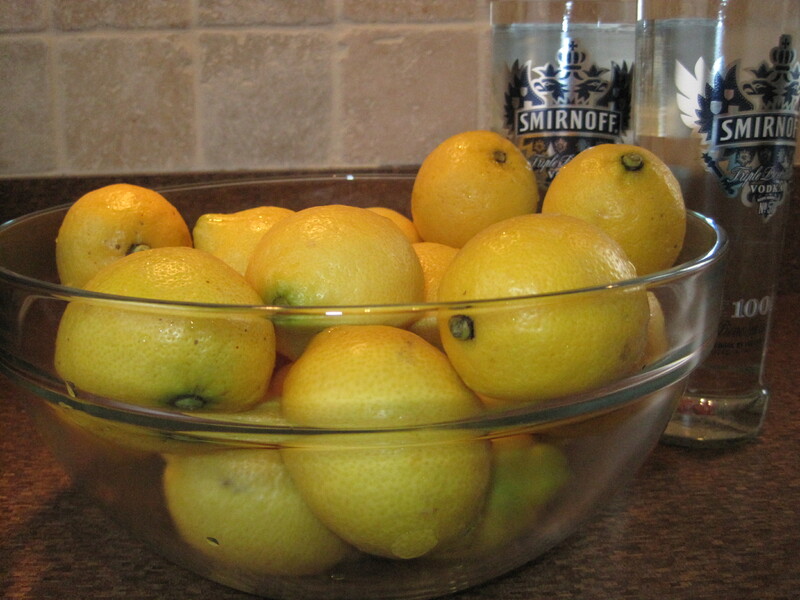 Next, I zested the lemons into my mixing jar. A Microplane comes in very handy for this step. I was careful not to zest into the white pith as this would make the limoncello bitter. It is best to zest right into the mixing container because the flavor of the zest is in the oils and you don’t want to lose any oils by grating into one vessel and then transferring the zest to another. Pouring the vodka into my mixing jar was easy, the hard part was getting the vodka and zest back into the vodka bottles for storage! I can see why most recipes advise mixing the limoncello in a one gallon jar with a tight fitting lid. I made quite a mess, but I finally was able to get all the vodka and zest back into the bottles without losing too much of either one. I closed the lids up tight and found a cool, dark closet shelf to store them for 45 days. Hold on, 45 days?!?! Yes, every limoncello recipe calls for infusing the vodka for 10-45 days, and then another 10-45 after adding the sugar syrup. I decided to go all the way to infuse as much flavor as possible into the limoncello. I guess all good things come to those who wait…for 90 days. See Step 2 for the end result!!! We had Limoncello over at our friends’ house last summer and it was SO strong–we were unintentionally drunk after one drink! Holy cow! Very interesting…. can’t wait to hear how it comes out. 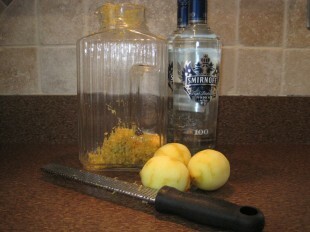 I made Lemoncello once but I think I only let the lemon steep in the vodka for 1 night. It was pretty good, even so, but I bet your version will be much better!